Latest reports indicate that the prescribed fire which escaped control at South Dakota’s Wind Cave National Park has burned 6,000 acres. 80 firefighters working the blaze in the parks steep and rugged terrain have established a line encircling the fire and containment is now at 30%. Estimates put it at being under control by Friday. Besides firefighters, a number of aircraft have been enlisted including two South Dakota Air National Guard Blackhawk helicopters and three Single Engine Air Tankers which are dipping out of Cold Brook Reservoir near Hot Springs. 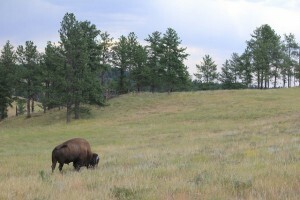 The fire is burning within the park in an known as the “keyhole,” which was acquired in 2011. Despite the fire, the park remains open. However, it’s backcountry and hiking trails are closed and visitors are strongly encouraged to stay on established roads and watch for emergency vehicles. 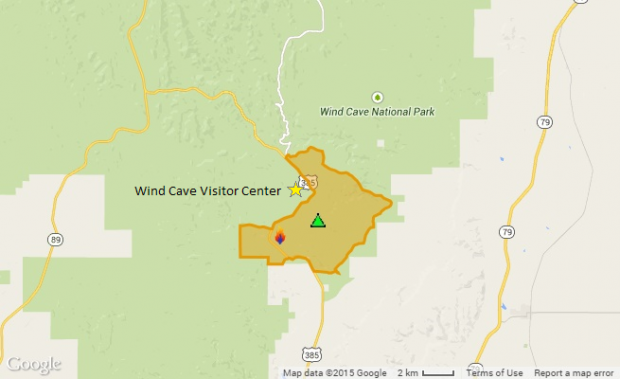 A map showing the park’s visitor center in relation to the fire at Wind Cave National Park.